Suspect In Natalee Holloway Case Pleads Guilty To Murder In Peru : The Two-Way Joran Van Der Sloot killed 21-year-old Stephany Flores on May 30, 2010, five years to the day after Holloway's went missing in Aruba. He has been arrested twice, but never charged, in relation to the Alabama teen's disappearance. 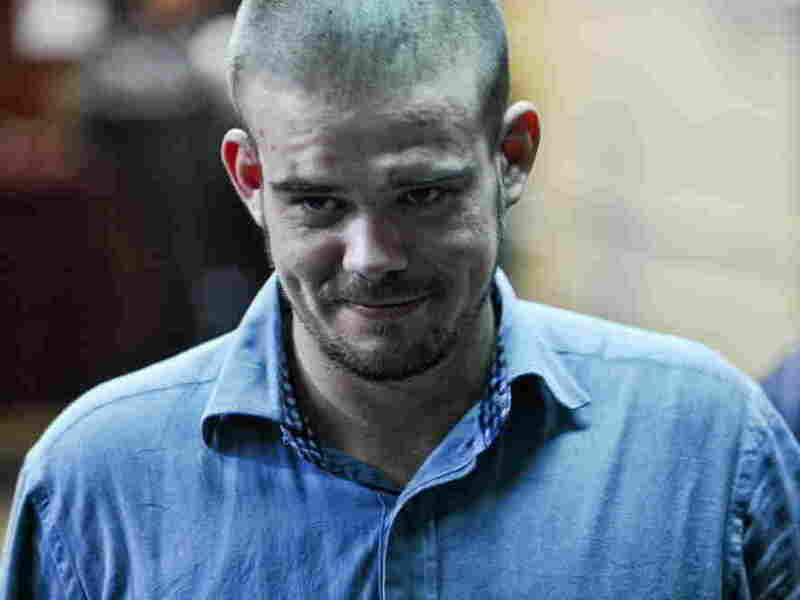 Dutch national Joran Van der Sloot as he arrived for a court hearing earlier today (Jan. 11, 2012) at the Lurigancho prison in Lima. Joran van der Sloot, the main suspect in the 2005 disappearance of Alabama teen Natalee Holloway in Aruba, this morning pleaded guilty to the 2010 murder of a 21-year-old Peruvian woman, Stephany Flores, in Lima. The Associated Press reports that van der Sloot told a court in Lima that "yes, I want to plead guilty. I wanted from the first moment to confess sincerely. ... I truly am sorry for this act. I feel very bad." "Van der Sloot claimed in a confession shortly after the May 30, 2010, murder [of Flores] that he killed her in a fit of rage after she discovered on his laptop his connection to the disappearance of Holloway. But prosecutors say Van der Sloot killed Flores, a business student from a prominent family, in order to rob her after learning she had won money at the casino where the two met." "The 24-year-old Dutch national faces a sentence of 30 years in prison, but his attorney hopes his guilty plea, called an 'anticipated conclusion of the process,' will reduce that term." As NBC-TV's The Today Show reminds us, "van der Sloot was arrested twice in the Holloway case but he was never charged due to a lack of evidence. Holloway's family has criticized Dutch authorities for not making more progress in the case."